Metals can be distinguished from non-metals on the basis of their physical and chemical properties. Recall that lustre and hardness are physical properties.You are familiar with a number of materials like iron, aluminium, copper, etc. Some materials have been given in Table. Metals are used in making machinery, automobiles, aeroplanes, buildings, trains, satellites, gadgets, cooking utensils, water boilers, etc. Take a small iron nail, a coal piece, a piece of thick aluminium wire and a pencil lead. Beat the iron nail with a hammer. (But take care that you don’t hurt yourself in the process). Try to hit hard. Hit hard also the aluminium wire. Then repeat the same kind of treatment on the coal piece and pencil lead. Record your observations in a Table. The shape of the iron nail and the aluminium wire changed on beating. If they were beaten harder these could be changed into sheets. Silver foil is used for decorating sweets and Aluminium foil used for wrapping food. The property of metals by which they can be beaten into thin sheets is called malleability. This is a characteristic property of metals. As you must have noticed, materials like coal and pencil lead do not show this property. You can't hold a hot metallic pan which is without a plastic or a wooden handle.Try to list some other experiences in which a wooden or plastic handle protects you from being hurt while handling hot things. On the basis of these experiences you say about the conduction of heat by wood and plastic. An electrician using his screw driver. What kind of handle does it have? 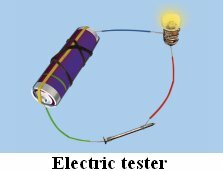 Recall how to make an electric circuit to test whether electricity can pass through an object or not. You might have performed the activity with various objects in Previous Classes. Now, repeat the activity with the materials such as Iron rod/nail, Sulphur, Coal piece, Copper wire. Observe and group these materials into good conductors and poor conductors. You observe that iron rod, nail and copper wire are good conductors while rolled sulphur piece and coal piece are poor conductors. Where do you find the use of aluminium and copper wires? Have you seen wires of coal? Definitely not!The property of metal by which it can be drawn into wires is called ductility. Notice the difference in sound on dropping an iron sheet/ plate, a metal coin, and a piece of coal on the floor. Note the difference in the sound produced. The things made of metals produce ringing sound when struck hard.Suppose you have two boxes similar in appearance, one made of wood and the other of metal. Since metals produce ringing sounds, they are said to be sonorous. The materials other than metals are not sonorous. After performing the above activities, we can say that some materials are hard, lustrous, malleable, ductile, sonorous and good conductors of heat and electricity. The materials which generally posses these properties are called metals. The examples of metals are iron, copper, aluminium, calcium, magnesium, etc. In contrast, materials like coal and sulphur are soft and dull in appearance. They break down into powdery mass on tapping with hammer. They are not sonorous and are poor conductors of heat and electricity. These materials are called non-metals. The examples of non-metals are sulphur, carbon, oxygen, phosphorus, etc. You are familiar with the phenomenon of rusting of iron. Recall the reaction by which rust is formed. You had also performed in Previous class an activity of burning a magnesium ribbon in air. You had learnt that in both the processes oxide formation takes place. Complete the following reactions of iron and magnesium with oxygen. Let us check the nature of rust formed as a result of the reaction between iron, oxygen and water. Collect a spoonful of rust and dissolve it in a very little amount of water. You will find that the rust remains suspended in water. Shake the suspension well. 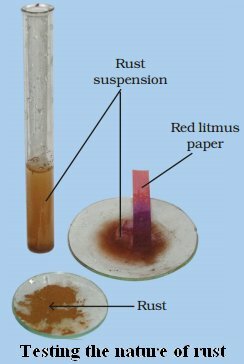 Test the solution with red and blue litmus papers. Now recall the activity of burning magnesium ribbon. The ash obtained on burning magnesium ribbon is dissolved in water and tested for its acidic / basic nature. You must have observed that the red litmus turns blue. So, oxide of magnesium is also basic in nature. In general, metallic oxides are basic in nature. Take a small amount of powdered sulphur in a deflagrating spoon and heat it. If deflagrating spoon is not available, you may take a metallic cap of any bottle and wrap a metallic wire around it and give it the shape. As soon as sulphur starts burning, introduce the spoon into a gas jar/ glass tumbler. Cover the tumbler with a lid to ensure that the gas produced does not escape. Remove the spoon after some time. Add a small quantity of water into the tumbler and quickly replace the lid. Shake the tumbler well. Check the solution with red and blue litmus papers. The sulphurous acid turns blue litmus paper red. Generally, oxides of non-metals are acidic in nature. Recall the name of some of the laboratory acids and bases. Note down their names in Table. Identify the metal or non- metal present in them which forms oxides with oxygen. Let us see how metals and non-metals react with water. Sodium metal is very reactive. It reacts vigorously with oxygen and water. A lot of heat is generated in the reaction. It is, therefore, stored in kerosene. Take a 250 mL beaker/glass tumbler. Fill half of it with water. Now carefully cut a small piece of sodium metal. Dry it using filter paper and wrap it in a small piece of cotton. Put the sodium piece wrapped in cotton into the beaker. Observe carefully. During observation keep away from the beaker. When reaction stops touch the beaker. Observe and feel the change.Test the solution with red and blue litmus papers. You observed that sodium reacts vigorously with water. Some other metals do not do so. For example, iron reacts with water slowly. Generally, non-metals do not react with water though they may be very reactive in air. Such non-metals are stored in water. For example, phosphorus is a very reactive non-metal. It catches fire if exposed to air. To prevent the contact of phosphorus with atmospheric oxygen, it is stored in water. Let us see how metals and non-metals behave with acids. Warning : Keep the mouth of the test tube away from your face. Use test tube holder to hold the test tube. Take samples of metals and non- metals listed in Table in separate test tubes and label them as A, B, C, D, E, and F. With the help of a dropper add 5 mL of dilute hydrochloric acid to each test tube one by one. Observe the reactions carefully. If no reaction occurs in a cold solution, warm the test tube gently. Bring a burning matchstick near the mouth of each test tube. Repeat the same activity using dilute sulphuric acid instead of the dilute hydrocholoric acid. Record your observations in the below Table. Is there a difference in the way metals and non-metals react with acids? What could the ‘pop’ sound in some cases be due to when a burning match stick is brought near the mouth of the test tubes? You must have found that non- metals generally do not react with acids but metals react with acids and produce hydrogen gas that burns with a ‘pop’ sound. You must have noticed that copper does not react with dilute hydrochloric acid even on heating but it reacts with sulphuric acid. During the preparation of sodium hydroxide solution, care should be taken that pellets of sodium hydroxide are handled with a plastic spatula. Prepare a fresh solution of sodium hydroxide in a test tube by dissolving 3-4 pellets of it in 5 mL of water. Drop a piece of aluminium foil into it. Bring a burning match stick near the mouth of the test tube. Observe carefully.What does the ‘pop’ sound indicate? As before, the ‘pop’ sound indicates the presence of hydrogen gas. Metals react with sodium hydroxide to produce hydrogen gas. Reactions of non-metals with bases are complex. Recall the activity of the reaction between copper sulphate and iron. Let us observe some more reactions of that kind. Take five 100 mL beakers and label them A, B, C, D and E. Take about 50 mL of water in each beaker. Dissolve in each beaker a teaspoonful of each substance as indicated in.Keep the beakers undisturbed for some time.  Record your observations in your note book. You can write down the reaction taking place in beaker ‘B’ in a similar manner. There could have been displacement of zinc by copper in beaker ‘C’ and by iron in beaker ‘E’. Similarly iron could be displaced by copper in beaker ‘D’. 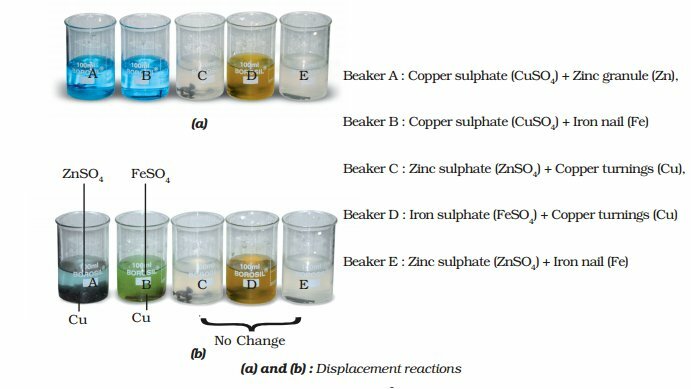 Since we do not see any change in beaker C, we can infer that copper is not able to replace zinc from zinc sulphate. When zinc can replace copper in beaker ‘A’ copper cannot replace zinc in beaker ‘C’. Remember that science is not arbitrary. It follows definite rules based on facts. And the rule here is that zinc is more reactive than copper and iron. A more reactive metal can replace a less reactive metal, but a less reactive one cannot replace a more reactive metal. Now you can understand why there are no displacement reactions in beakers D and E also. Metals are lustrous whereas non-metals have no lustre. Generally, metals are malleable and ductile. Non-metals do not have these properties. Generally, metals are good conductors of heat and electricity but non-metals are poor conductors. On burning, metals react with oxygen to produce metal oxides which are basic in nature. Non-metals react with oxygen to produce non- metallic oxides which are acidic in nature. Some metals react with water to produce metal hydroxides and hydrogen gas. Generally, non- metals do not react with water. Metals react with acids and produce metal salts and hydrogen gas. Generally, non-metals do not react with acids. Some metals react with bases to produce hydrogen gas. Metals and non-metals are used widely in every day life.